International single-track and two-day conference covering all about modern web technologies. 18th–19th July 2019, Barcelona. After a very successful 2018 edition, with 530 professional developers attending from 52 countries, we‘re pleased to announce that JSCamp 2019 is back on 18–19th of July with a promising line-up in the comfortable Axa Auditorium in the heart of Barcelona. You can expect a promising and diverse speaker line-up. Early Bird tickets are flying very fast. We expect to sell out soon, secure your spot at the best price now. We would love to welcome you this summer! If you’ve been to JSCamp, you know that you’re in for some of the most thought-provoking and inspirational days of your professional year. And if you haven’t been yet, join us! Meet international teams to know how they work, the problems they face, and the challenges they succeeded. JSCamp is an International single-track, two-day conference curated, deeply technical, covering all about modern web technologies. The event focuses on the community providing a platform for communication and collaboration where passionate developers come together to advance in their projects and careers in an inclusive and collaborative space. We want to encourage and inspire the next generation of web developers. It’s an independent event organized by a passionate team, who wants to provide the best conference experience in Barcelona. JSCamp it’s the perfect opportunity to grow your career, expand your network, make meaningful connections, exchange ideas, hands-on learning, meet your peers from the community and understand the current and future needs of web developers. There is a lot to gain from sharing best practices and case studies from different developer tools, new frameworks, platforms and techniques across the web stack. We are also pleased to announce our very first edition of CSSCamp 2019, a one-day, one-track conference for developers and web designers, held on July 17th right before JSCamp at the same venue, the comfortable Axa Auditorium in Barcelona. 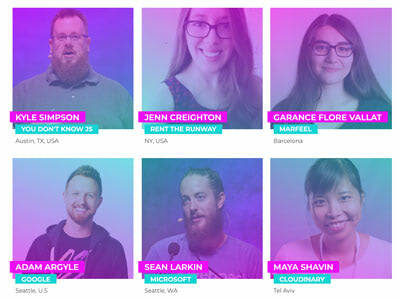 You can expect a promising and diverse speaker line-up from every corner of our community. We aim to build a bridge in the frontend community. Now you can get both conferences in just one transaction with our combined ticket. Don´t go alone, bring your whole team! The Call for Papers closes on March 24th, 2019, midnight CET. We spend a lot of time choosing not only the best speakers on their skills but also strive to bring together a diverse group. If you already bought your ticket or you are planning to attend anyway, we will reimburse it if your talk application is selected. Barcelona is attracting the attention of many startups (both entrepreneurs and big corporations) and becoming the jewel of the Mediterranean as a robust and diverse start-up ecosystem thanks to a reliable infrastructure and top-notch talent. We are proud to receive the Institutional support of the Catalan Government: Generalitat de Catalunya and SMARTCatalonia. At JSCamp, we strongly believe companies, that hire people with a varying background, experiences and cultures become stronger and more competitive. Therefore, we make an effort to help developers from marginalized groups and make our event a welcoming event with equal representation. 12% of our attendees in 2018 could join through our diversity program. We could not do this without the great support of our conference sponsors: npm, Mozilla, Marfeel, Valor Software, Ionic, New Relic, NetCentric, Modus, and Slack. We are always looking for companies, organizations, sponsors, and supporters, engaged in our growing and thriving community, that want to help us make an impact. There is still so much to do and we need your help. Support one of the most iconic web conferences in Europe, taking place in the beautiful city of Barcelona. If you are interested to be part of JSCamp as a sponsor: let’s talk! Contact us via e-mail at sponsors@jscamp.tech. Thanks to our Code of Conduct, we are able to create a great atmosphere and attention to detail in order to guarantee a great experience for all of our attendees in a welcoming, inclusive and safe tech conference. Any harmful or discriminating behaviour will therefore not be tolerated. Thank you for your interest in speaking at JSCamp 2019! We are looking forward to reading your proposals. Secure your spot now and benefit now from the best price! Subscribe to our newsletter and you’ll always know what’s up!